After my scone eating frenzy this past week, I decided that it was better for both my health and bank account to make them myself. 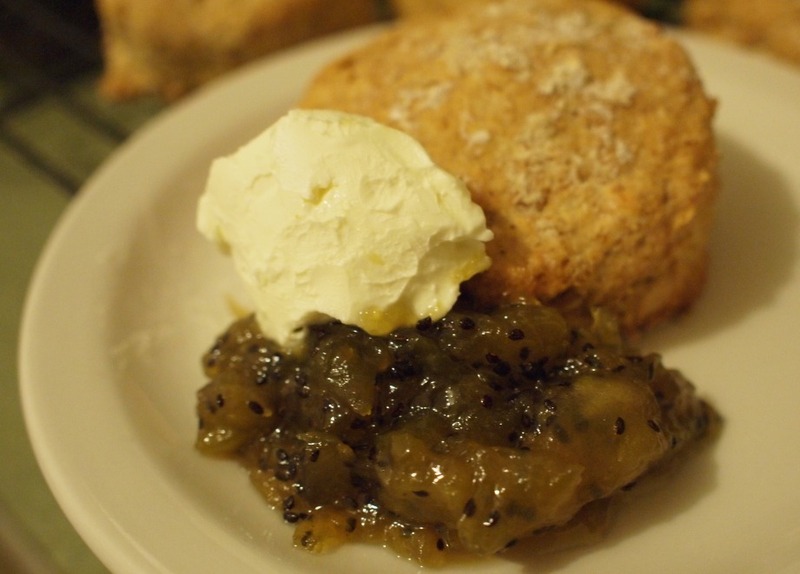 Of course, there should always be jam available when eating scones, so I figured that the kiwis that were left-over from the fruit boxes at work should be used to make kiwi jam too! A little bit of browsing on the internet left me with two workable recipes. Brilliant. Or so I thought. It wasn't until I actually checked ingredients that I realised I was missing quite a few (self-raising flour, baking powder, lime juice, pineapple juice and pectin). So what follows are my adapted recipes based on memory and what I had at hand. I know I don't usually post recipes up, but there's a first time for everything. Enjoy, and let me know how they turn out for you. Preheat an oven to 200°C and lightly flour a baking tray. Mix the flour and baking soda together in a large bowl, then rub in the butter using your fingers until the mixture resembles fine breadcrumbs. Add in the yogurt and mix until just combined. Make a well in the center of the mixture, and pour in half the milk. Mix with a flat-bladed knife. Add more milk as required to make a slightly soft dough, but be careful not to overmix or else the scones will turn out hard. Roll out the dough into a 2cm thick sheet. Cut out 5 cm diameter circles and place them 2cm apart on the baking tray. 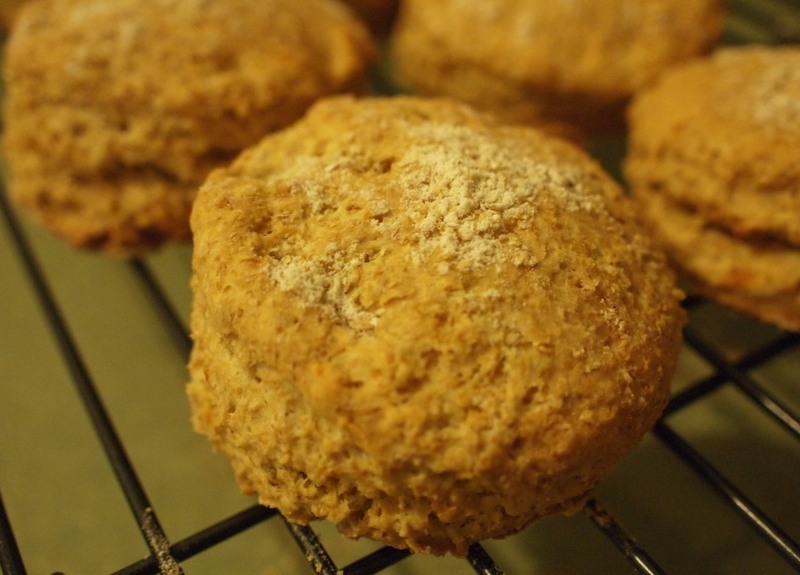 Sprinkle a small amount of flour on top of each scone, and bake for 20-25 minutes until the scones have risen sufficiently. Throw everything except the sugar into a medium sized pot and boil on a stove. When mixture starts boiling, add sugar and reduce to simmer. Leave for around 30 minutes, stirring occasionally. It's a little hard to tell when the jam is ready to 'set' but you should be alright. A 500 mL jar is about the right sized container for these quantities, so sterilize the jar (and lid!) and transfer the jam from the pot into the jar. Screw the lid firmly back on the jar. Find a largish pot (a cylindrical one works better than a flat circular one) and boil water so that when the jar is placed in the pot, the water level is half-way up the jar. Add more water to the pot until the water level is about 1 cm above the top of the jar. Let boil for 10 minutes then carefully remove jar from water. Ah, too easy. The jam was perhaps a little too sweet for my liking (note: try replacing lime cordial with lime juice, or reduce sugar) but it was tasty. I felt accomplished in having made something that you can't readily buy off supermarket shelves. Not a bad effort for a sleep-deprived desk worker and gym junkie! This makes me want to go on a scone-eating frenzy. Love the jam recipe.